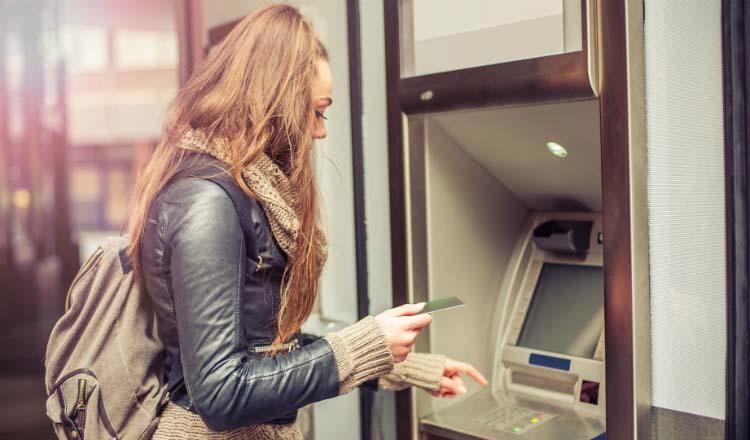 There are more than 400,000 ATMs in the United States and that number is growing. Banks work in each community to provide a service while keeping customers’ money safe at those locations. But individuals have an opportunity to help with security as well. “If you see something, say something‡ ” is a national campaign created by the U.S. Department of Homeland Security that raises public awareness regarding crime indicators and the importance of reporting suspicious activity. Individuals can use resources like this and the information below to become more aware of how they can play a part in ATM crime prevention and reduce personal risk. Understanding what to look for and knowing how to report is crucial in helping stop ATM skimming. What does an ATM skimmer look like? Here you will see the PIN capture camera in place at the top of the screen where it should be flat and the magnetic strip data skimmer in place on the card reader. If you notice or see something like this on an ATM, report it to local law enforcement immediately. First and foremost, use your hand to shield the ATM keyboard as you enter your PIN. A skimming device must capture your PIN by video for fraudsters to use captured card data. Keep your PIN number a secret. Never write it down or share it with anyone – not even family members. Be aware of your surroundings, particularly at night. Make sure the ATM is free of sight obstructions. If you observe suspicious persons or circumstances, do not use the machine. Bring someone with you when using an ATM at night. If you can’t, use an ATM that is located in a public area like a convenience or grocery store. If you suspect the card reader or the security seal on it has been tampered, find another ATM to help avoid a potentially fraudulent reader. Have your ATM card ready and in your hand as you approach the ATM. Always take your receipts or transaction records with you. Do not count or visually display any money you received from the ATM. Immediately put your money into your pocket or purse, and count it later. Remember, if see something suspicious, report it immediately. For more information on ATM crime prevention and other scams impacting consumers, visit our Scams to Watch page on UMB.com/Security. Mr. Hanson serves as vice president and fraud manager in Card Operations. He is responsible for providing fraud detections, prevention, and investigation services to UMB’s credit and debit card customers. He joined UMB in 2010 with more than 15 years of credit card fraud prevention experiences. He earned a Bachelor of Science in political science from the University of Utah in Salt Lake City, Utah and a Master of Arts in national security affairs from the Naval Post-Graduate School in Monterey, Calif.